If you are ever lucky enough to make it into the Guinness World Records, it’s a pretty big deal. Some work their whole lives to beat a world record. Athletes, for example, will push themselves in their careers to be the person who takes home a new record. Because, when you beat a world record, it means you are singular and unique, no one else is at that same level as you. But some world records aren’t from talent, they are from simply being a certain way that no one else in the world can match. 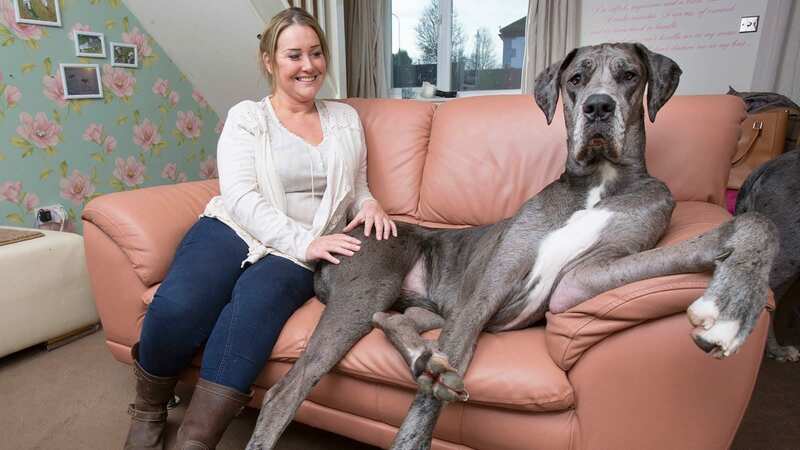 That’s how one British woman soon found herself the proud owner of the biggest dog in the world. 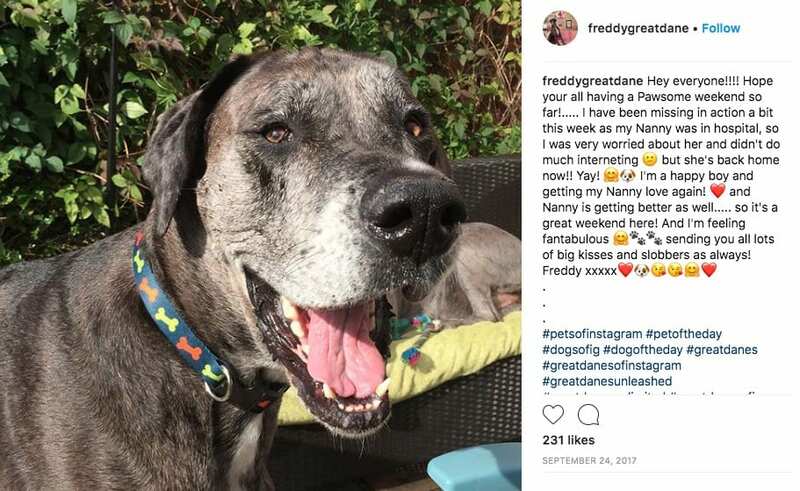 A Great Dane named Freddy, living in Essex, earned the official title from the Guinness World Records a couple years ago for world’s tallest dog, and he still holds the title today. While his large stature might be intimidating to many people, this friendly mammoth of a dog is as adorable as they come. Something about his sweet nature, combined with his massive size, is just completely irresistible. His pictures are sure to make you smile, so keep reading to learn all about the delightful Freddy. Claire Stoneman is an Essex local, and has spent most of her life in the area. Currently 41 years old, a large part of her life centers around her dogs. However, during the late ‘90s, Claire used to work as a glamour model . She has gone through many ups and downs in her life, including surviving a car crash in 2004 in which she broke almost every bone in her body. But she persevered and spent many years working as a cab driver in a bright pink car, determined not to let anything get her down. 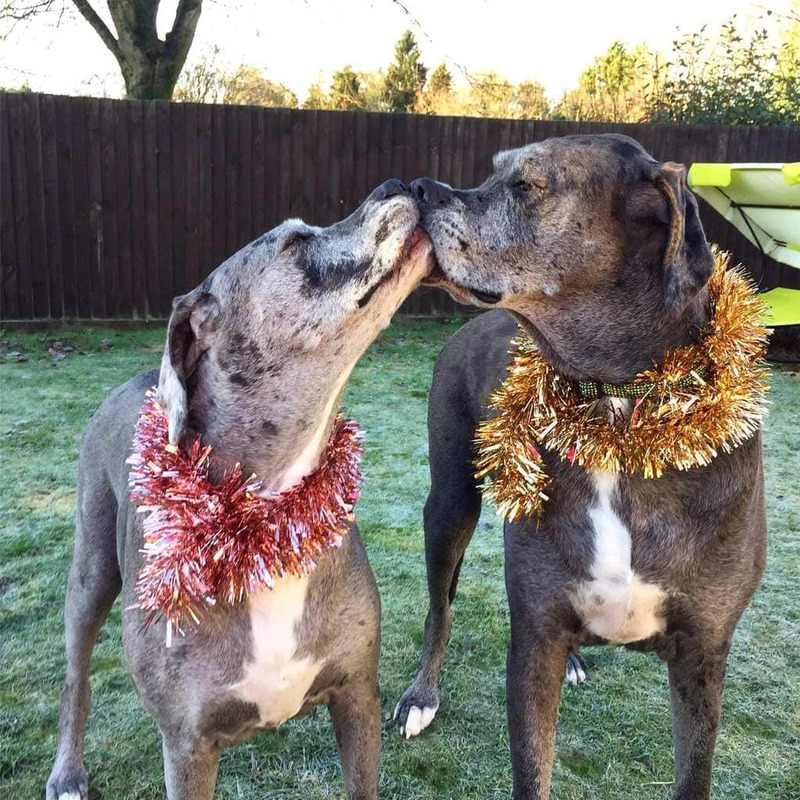 One day, when she saw a notice that there were two Great Dane puppies available for adoption, she knew that her life could only improve by having these dogs in it. In 2012 when Claire went to pick up her two new puppies she couldn’t get over how small and cute they were. At only five weeks old, Freddy and Fleur were the runts of the litter. Claire shared that they hadn’t been nursing properly from their mother, which had left them without some very necessary nutrition. They were so small, she could fit one in each of her hands. 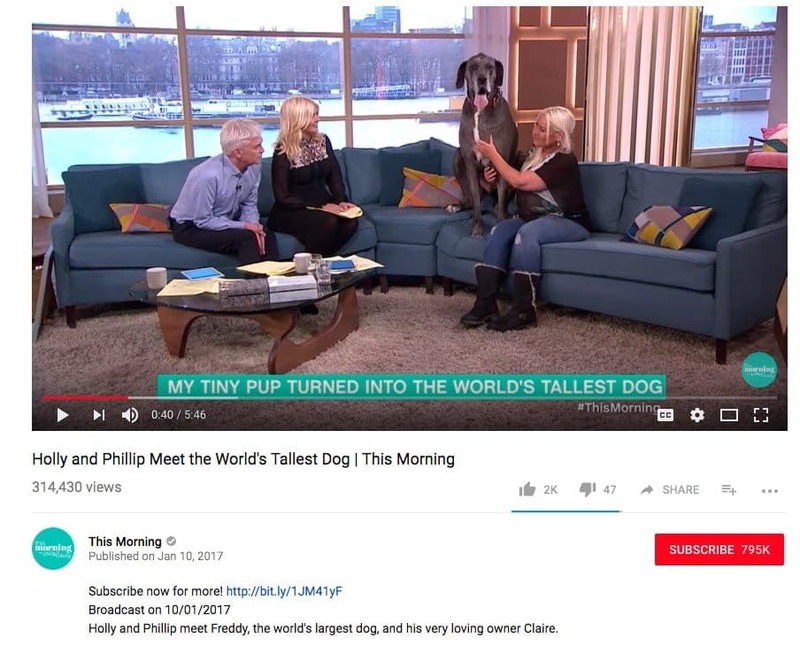 In an interview Claire confessed that at the time she wasn’t sure if they would even reach a normal height for Great Danes. Claire immediately went to work at getting these puppies well fed and spoiled. The puppies soon found themselves feeling great with loads of puppy energy, which they unfortunately took out on the house. Claire shared that her dogs destroyed a total of 23 couches as puppies! And as they got bigger and bigger, it became clear she may need to get some substantial places for everyone to sit. Claire couldn’t believe how big her little runts were getting! Both Fleur and Freddy kept growing, but Freddy was growing at a pace that that had everyone shocked. Friends began making comments about how quickly his size was changing and Claire realized she might had been wrong about how big he would get. As a puppy, in one week alone he put on 8 pounds. 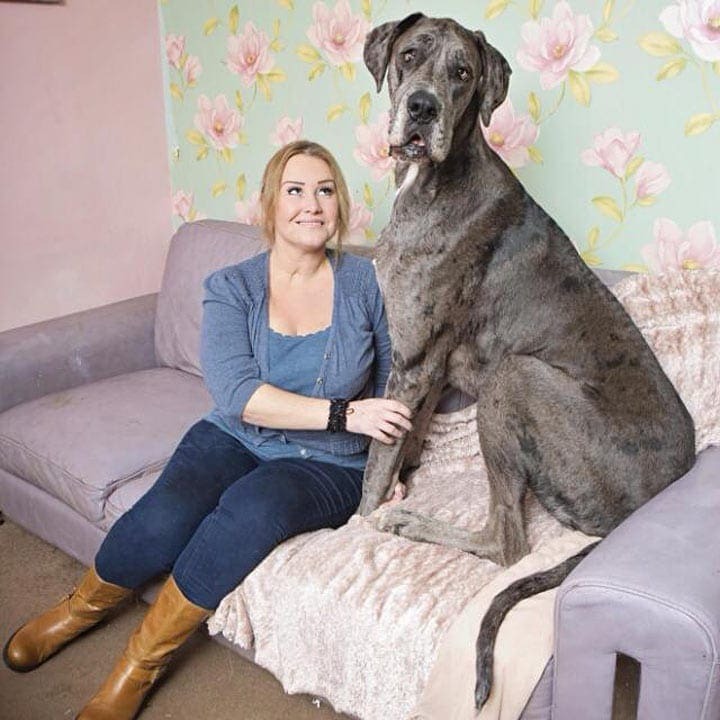 By the time Freddy was 18 months old he was already gigantic – he had already been declared to be the largest dog in Britain, and he wasn’t even fully done growing yet! 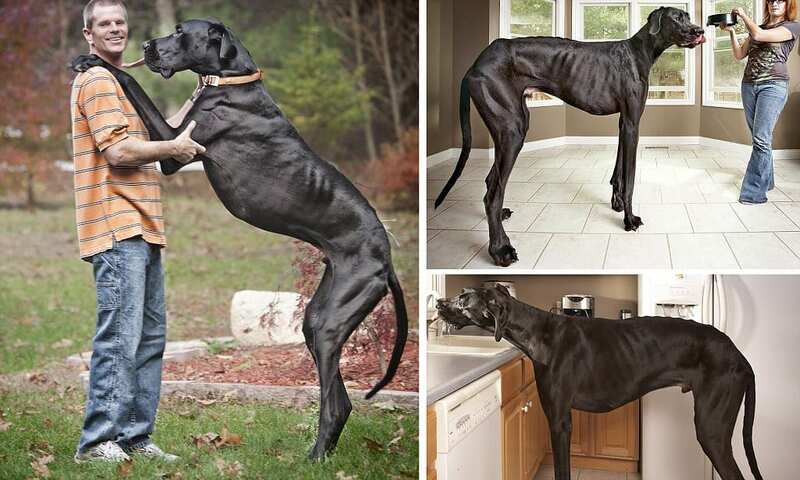 Once Freddy was full grown, one thing became very clear – this dog was enormous! People everywhere couldn’t get over his size. In December 2016 things became official for Freddy when he was declared to be the world’s tallest dog by the Guinness World Records. Freddy measured at about seven feet and six inches on his hind legs, and weighed over 200 pounds. This makes him far taller than Claire, who is just five feet and four inches tall. Despite Freddy’s massive size, he is truly a very friendly and gentle dog. He loves to meet new people and make new friends wherever he goes. In fact, Claire constantly tries to invite people to say hello and not be afraid of him. But like many big dogs, Freddy isn’t always aware of his own size and strength. Claire explained in an interview that he’ll never intentionally hurt someone, but that occasionally he does accidentally knock people over. In addition to all the people Freddy loves, he is also deeply attached to his sister Fleur. Fleur herself is also a very sweet dog, although not quite as large as Freddy is. 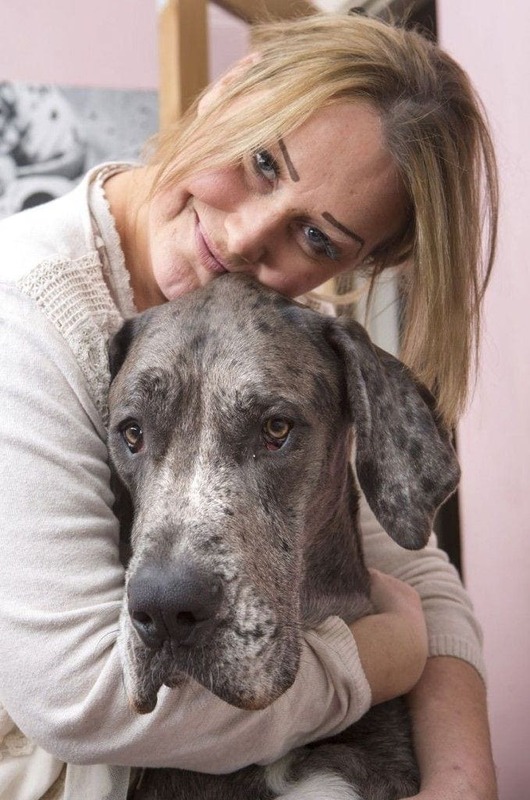 Nevertheless, Claire has pointed out that Fleur is considered large for a female Great Dane. It’s certainly ironic considering that as puppies Freddy was only half his sister’s size! Now he easily towers over her. But that doesn’t stand in the way of them playing and cuddling together. 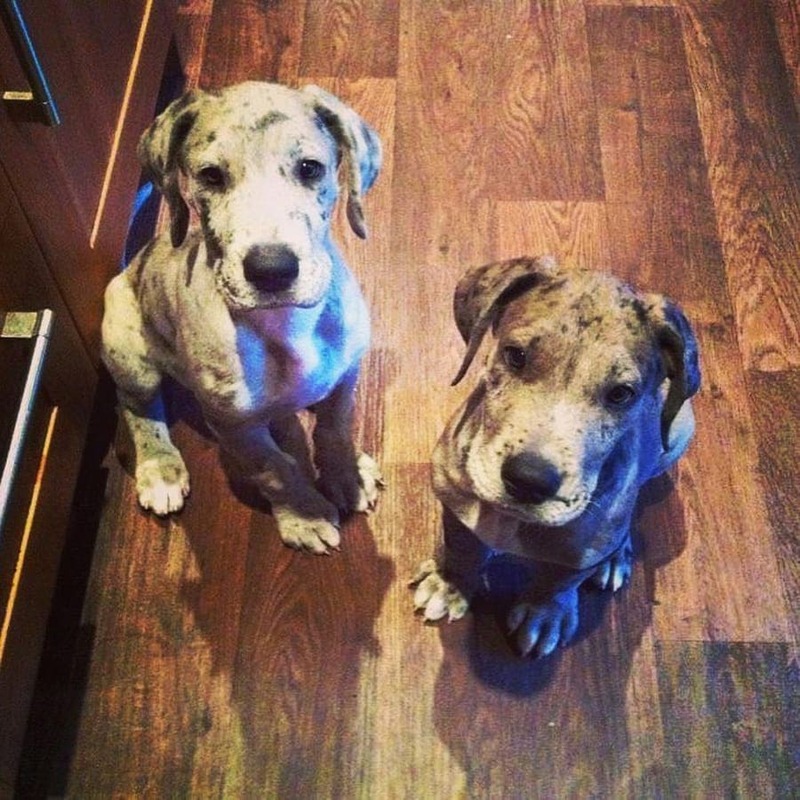 Great Danes are known in the dog world for being patient, dependable, and very friendly. 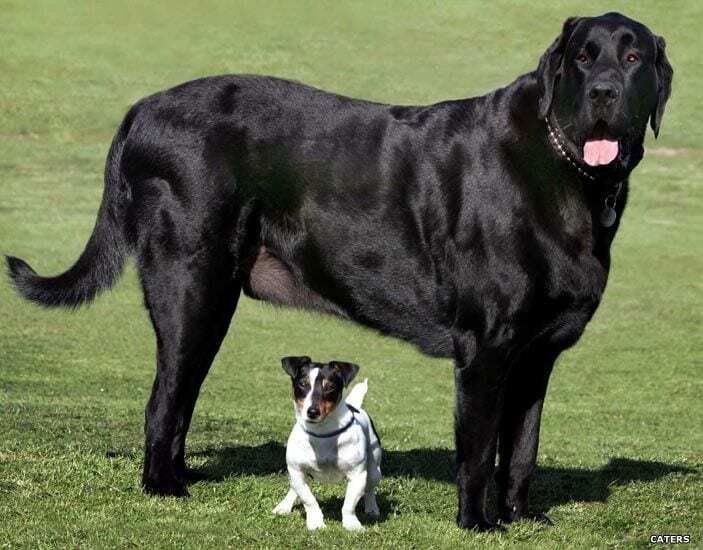 Because of their large stature, they have earned the title of being the “Apollo of dogs.” Many people also think of Great Danes as the ultimate gentle giants, and they are generally very affectionate with their owners. 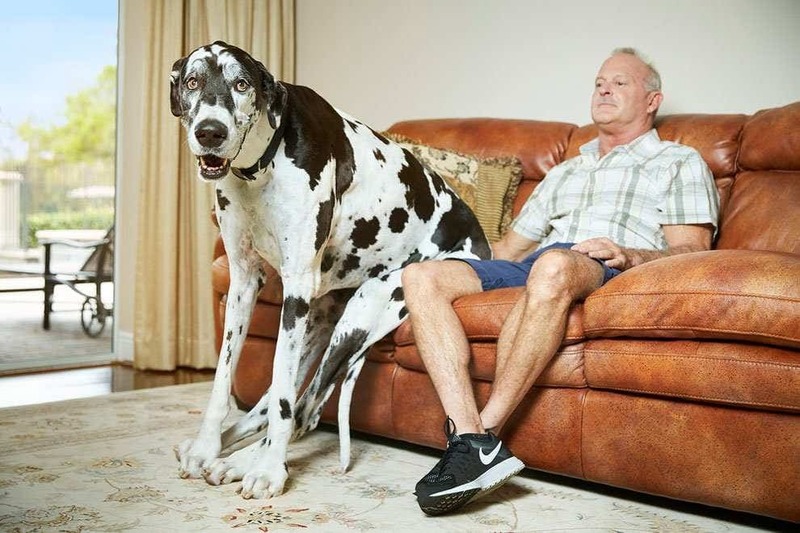 Some even joke that they are the world’s largest breed of lap dogs because many try to sit on their owner’s laps, despite their size. 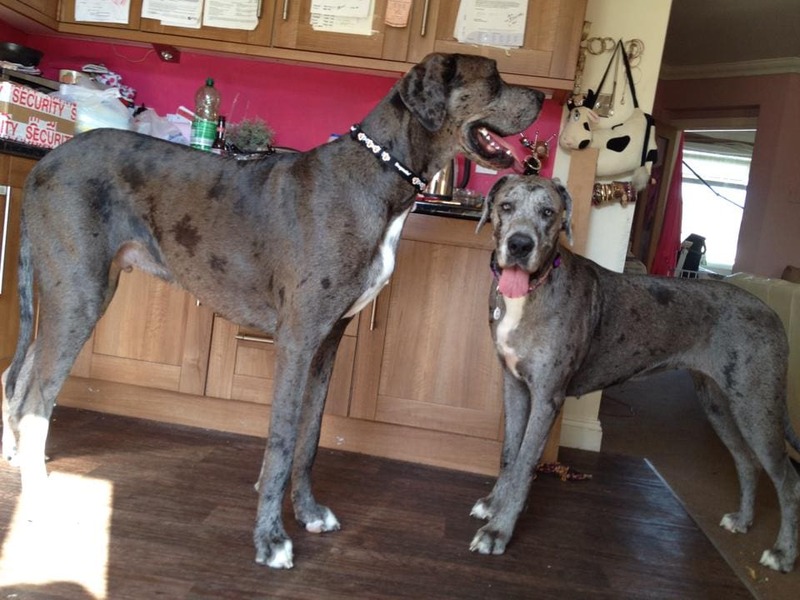 If you’ve got the room, Great Danes are certainly a wonderful type of dog to have in your family. Claire had never owned a Great Dane before she took home Freddy and Fleur, and for the most part she was unfamiliar with the breed. 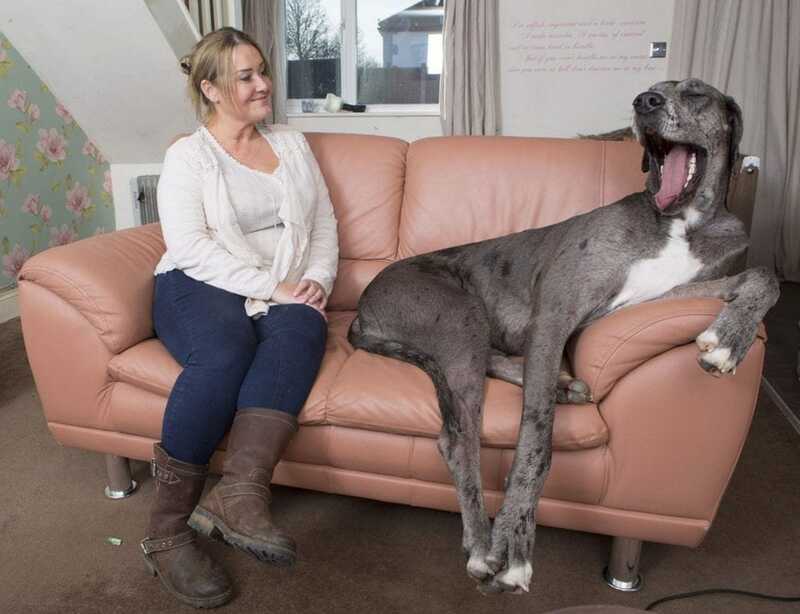 While Great Danes do make great family pets, because of their size they can be a lot to handle. Claire had no idea what she was getting herself into, but now she loves her dogs and can’t imagine life without them. That said, she has sacrificed her love life for them, and devotes a large portion of her finances to them. But for her, it’s all worth it. All in all, Freddy leads a pretty charmed life for a dog. Claire confesses that she probably spoils her dog, and spends a lot of money just on buying them their favorite foods. Freddy enjoys eating roast chicken, peanut butter, pate on toast, tripe, sausages, and occasionally even taking a sip of coffee. He is also lucky enough to have an owner willing to wake up extra early to take him on nice long walks so he can get all the exercise a big guy like him requires. Like many dog owners, Claire just couldn’t resist putting pictures of her lovable dogs on social media. But once word got out about Freddy’s claim to fame, and how he was the tallest dog in the world, people from all over the world were soon fawning over Freddy on the internet. His pictures receive hundreds of likes, and videos of him have thousands of views. 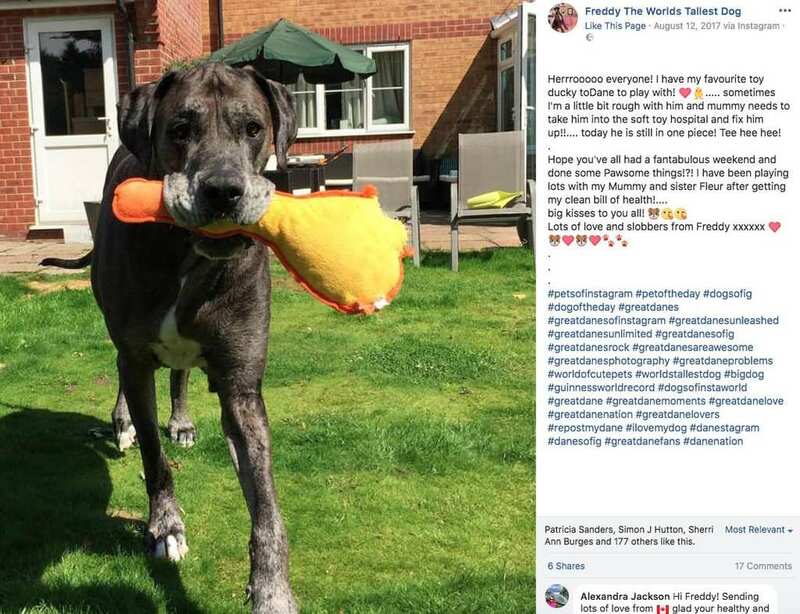 People often comment on them, expressing how adorable they find the giant dog, and sometimes sharing pictures of their own big dogs, as well. Freddy grew so popular that Claire decided to create his very own social media pages. Made sense, especially since people seemed to want to know everything about him. Freddy now has his very own Facebook, Instagram, Twitter, and YouTube pages. He even has his very own website where you can read blogs and contact him. On Instagram alone Freddy has over 6,300 followers, and on Facebook it’s close to 19,500! He has certainly become quite the big star. Freddy’s popularity isn’t just on social media. With his world record on the books, Claire and Freddy were soon being asked for interviews by numerous news outlets, and the story has been published in a number of publications. Claire has brought him to London for interviews with news programs such as This Morning and BBC. The story has also been reported on by The Telegraph, The Guardian, The Daily Mail, International Business Times, and more. People can’t get enough of him! Over all the attention that Freddy has brought in has largely all been very positive. His posts are flooded with comments where people express how much they adore and love this dog. It’s brought some very positive attention for Claire as well. After years of working as a cab driver, she is hoping to start finding work again in modeling or acting. Her numerous TV appearances with Freddy and professional pictures are a big boost for helping to get her name out there. We hope she’ll have lots of success! Freddy wasn’t always the tallest dog in the world. Before him came the dog Zeus, who lived in Michigan with his owners Denise and Kevin Doorlag. On his hind legs he reached seven feet and four inches, pretty close to Freddy. In addition to being a record holder, Zeus was also a certified therapy dog and spent lots of time visiting schools and hospitals. Sadly, in 2014 Zeus passed away from old age, but he is the kind of dog who will certainly be remembered fondly. 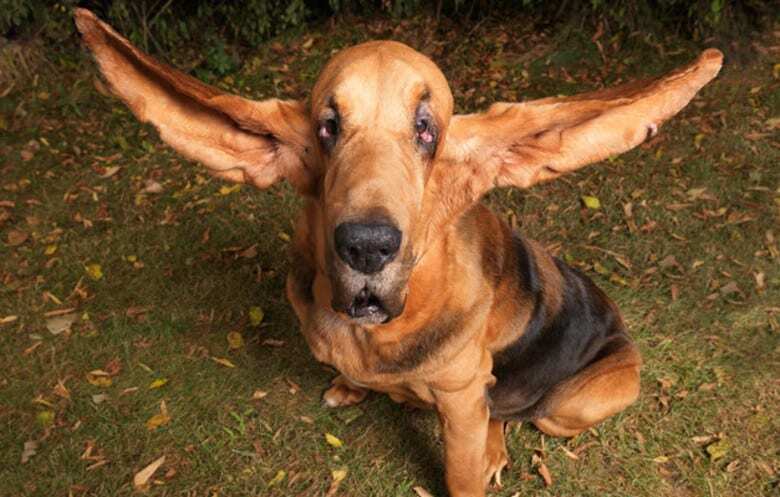 Before the Guinness World Records, the first step in Freddy’s record breaking was taking over the title of Britain’s biggest dog. He took it from a British dog named Samson, who is a mix of Great Dane and Newfoundland. He is an impressive six feet and five inches tall, which is huge, but still not quite as big as Freddy. 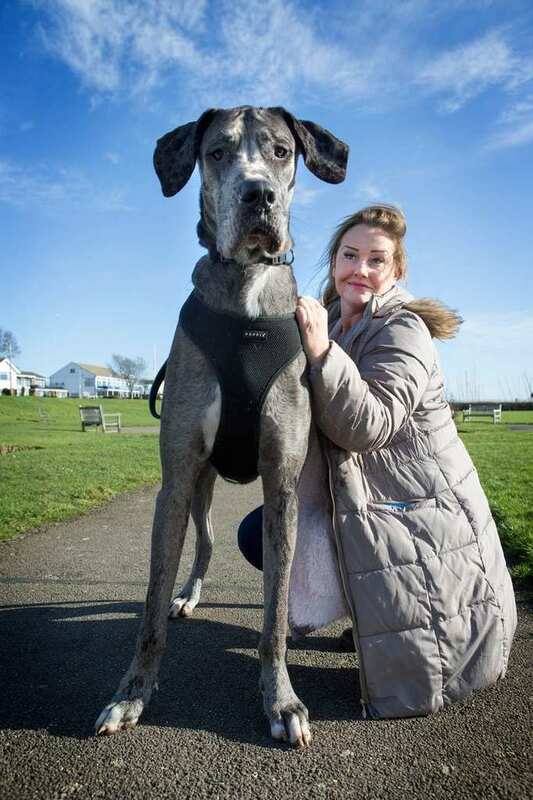 Samson’s stature also often intimidates people, but his owners Ray and Julie Woods insist he is very sweet and gentle. There are other dogs out there who have also made it into the record books as well. 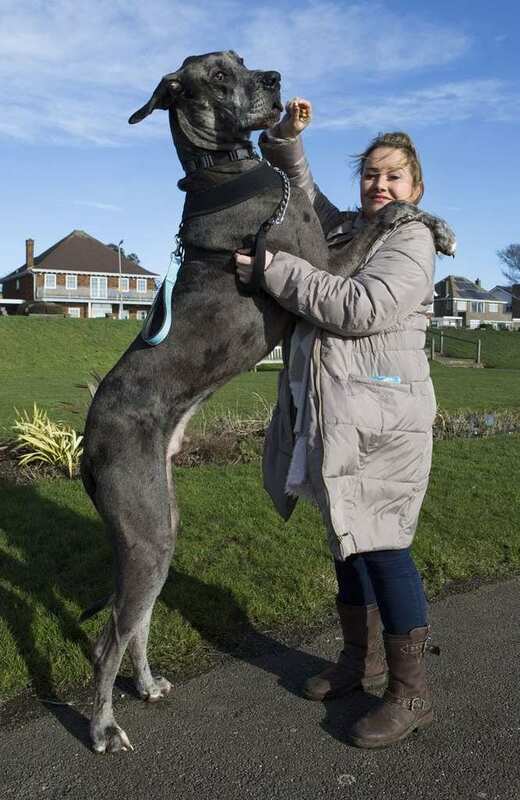 A Great Dane named Lizzy currently holds the world record for the tallest female dog. She lives in Florida with her owner Greg Sample, where she enjoys relaxing around the house and going for rides in the car. Greg shared that he had to buy a measuring tool meant for miniature ponies in order to get her measurements, because regular tools just didn’t cut it. Like the others, she has a very sweet and mellow temperament, and loves to be around people. 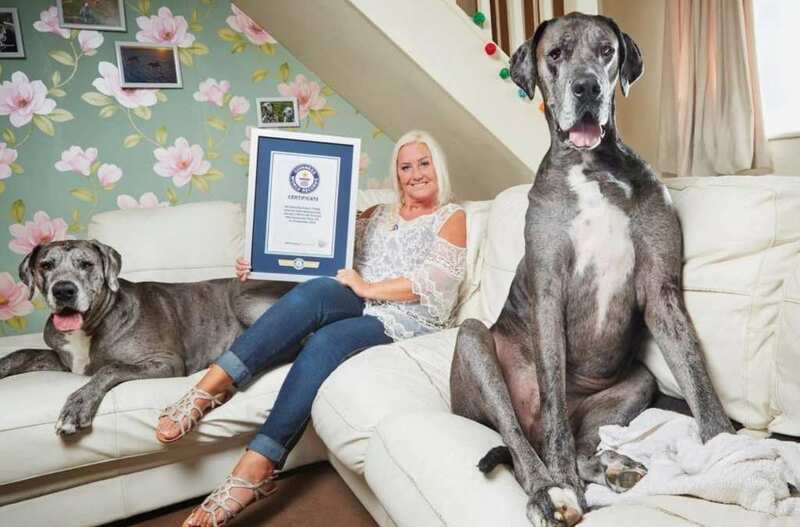 Dogs aren’t the only animals who are making it into the Guinness World Records. Meet Hercules, who in 2014 won the record for being the largest living cat in the world. 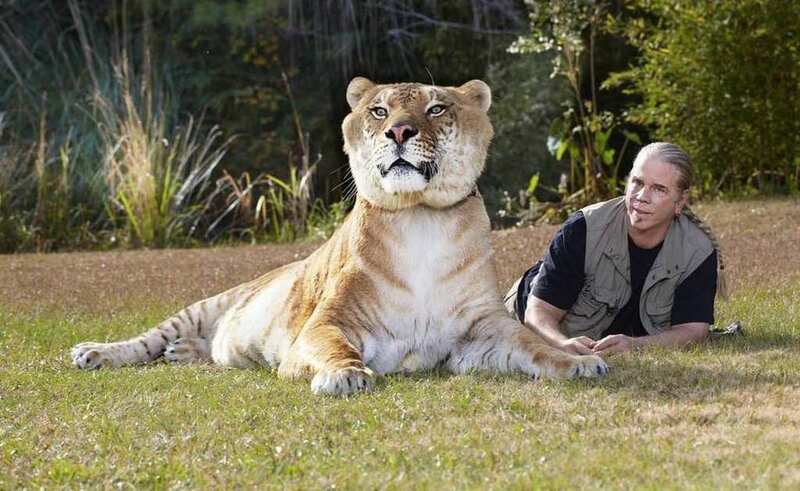 Hercules is a liger, which is a hybrid between a lion and tigress. He lives at a wildlife preserve in Myrtle Beach, South Carolina where caretakers take excellent care of this big guy. He weighs a whopping 922 pounds, and is 131 inches long. He even puts Freddy to shame with those measurements! Guinness World Records can go to any animal, and have have been known to size up all creatures under the sun. 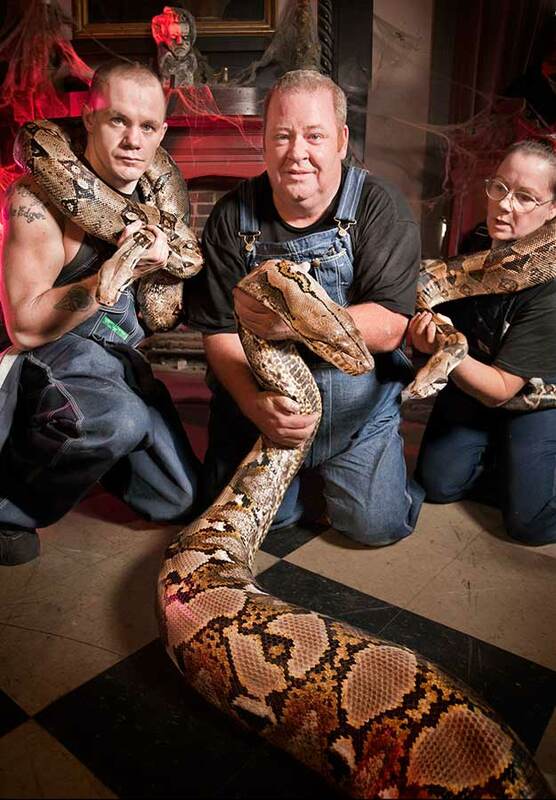 In Kansas City, Missouri you can find the world’s longest snake living in captivity. Her name is Medusa and she is a total of 25 feet and 2 inches long, pictured in the middle alongside a couple of her smaller companions. To hold her at full length requires around 15 people! Medusa is so big that she has been known to be able to consume an entire deer, whole, in one sitting. We definitely wouldn’t want to mess with that snake.